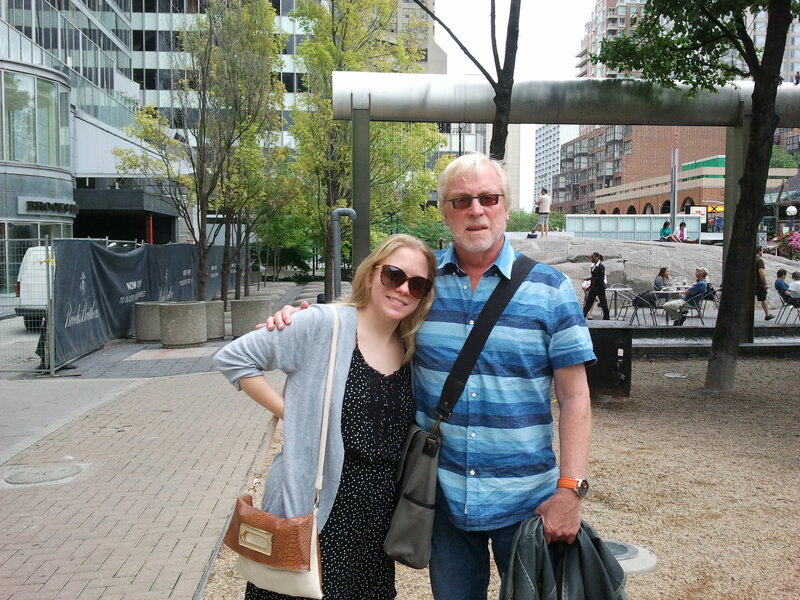 Allan with daughter Beatrice in Toronto. Allan Irving teaches in the social work programs at University of Pennsylvania and Bryn Mawr College. I moved to the US from Toronto, Canada, in 1998 with my wife, Dianne and son, Dylan, when I accepted a faculty position at Widener University’s Center for Social Work Education. After teaching at the University of Toronto from 1984 through the late 1990s in social work, I decided I was ready for a change. A major factor in deciding to leave the University of Toronto was the rapid corporatization of the university and how this was negatively affecting and undermining its academic purpose. I became involved through the faculty association—I was chair of the academic freedom committee—in many anti-corporate protests on the campus. Dianne’s family was located in the Philadelphia area and Dylan would have more family here. This decision meant leaving my daughter, Beatrice, to be with her mother, which proved very challenging. That, along with my ambivalence about life in the United States in the early 2000s led me to accept another faculty position at the University of Western Ontario in 2003. In 2011, after many trips back and forth and much uncertainty, I returned to the US where I now teach part time in the social work programs at the University of Pennsylvania and Bryn Mawr College. During the years that I travelled frequently between Canada and the US (2003–2011), I had many confrontations with immigration officers on both sides of the border. Once I was denied entry back into the US because I refused to answer questions I felt were inappropriate and intrusive. I have, since I was young, challenged and opposed arbitrary authority. There are many reasons for my ambivalence in leaving Canada. Though the countries seem similar, their differences are profound. The most notable difference involves universal healthcare. It was fully implemented in Canada in 1968. It is much more equitable. No matter your financial situation, no necessary care is excluded, and anything covered by the public system cannot be provided privately. I also had trouble with the extent of American racism. I notice it all the time. Canada is not without it, and has had many problems with the treatment of indigenous peoples. As in so many societies, racism presents a range of challenges; I truly believe there is greater openness to social justice in Canada. When Pierre Trudeau was elected as Canada’s Prime Minister in 1968, it was on the promise of creating a just society. Fundamental to Canada’s constitution is that it supports and promotes a multi-cultural society, in its commitment to “peace, order and good government.” In the 1960s, 60,000 Americans moved to Canada. One of my closest friends in the 1970s was an American draft dodger. And Canada was the destination of many escaped slaves through the Underground Railroad. Canada has often been a haven for—and welcomed—American dissenters. Canada also has much greater public support for the arts. In the 1950s, there was great concern about too much American influence on the arts in Canada. In 1954, government support of the arts and a publicly funded film industry were firmly established and continue into the present. Since 1933 the Canadian Public Broadcasting System was a way to hold the country together through communication. Even people who live in the far north listen to the CBC. It is significant that one of the 20th century’s most prominent philosophers of the media of communication was the Canadian and University of Toronto professor Marshall McLuhan. The attitude toward government in Canada is much less antagonistic. Though it is changing, unfortunately, I think that seeing the government in partnership with the citizenry to achieve greater social good is more prevalent in Canada than it is here. More people participate in elections. America is a great democracy, but statistics indicate that people don’t vote. I love Toronto. I am still a Canadian citizen. I have a green card and do not, at this point have plans of becoming an American citizen. But I do I love Philadelphia, with its vibrant cultural scene; to be able to hear one of the world’s great orchestras live on a regular basis is a pleasure I once only imagined. I feel pulled by different cultures. Canada and the US are not the same. The US had a revolution to become a country; Canada became a country through consensus and agreement with Great Britain. I think that accounts, to a large extent, for the differences in the cultures. An undergraduate history professor of mine published a book, Canada, the Peaceable Kingdom, which influenced me considerably years ago. When Dianne and I moved to the US, friends held a “bon voyage” party for us. They gave us two sculptures, an Uncle Sam statue with an American flag and a Canadian “Mountie,” and insisted, “You’ll be back.” We often contemplate that return. We’ll see.